Uhhh... * looks at mask collection * does Toa Ignika's Ignika count? Or Lhikans Hau? I have a buttload of copper Hunas tho. What would you use it for? Hautaka's non-matoran form? I'll definitely try to get a copper Komau as well, though. So, with the '01 masks more or less complete - do Krana count as masks? Because I figured having a complete set of Krana might be nice, too. And they probably wouldn't be too expensive, making them ideal to buy alongside parts for MOCing. What about the Toa Mata with golden masks? You can go for that look. @Gilahu your Krana are triggering me. They are obviously laid out in rows, but there is no organizational logic to their placement! They aren't sorted by color. Nor are they sorted by breed. WHY? there is no organizational logic to their placement! I got a crome Hau mask which is a rare mask. I'm just a sucker for grid based organizational systems on incomplete sets. It makes it very easy to see what's missing. Cell based systems are great for complete sets, but incomplete sets, not so much. At least in my opinion. 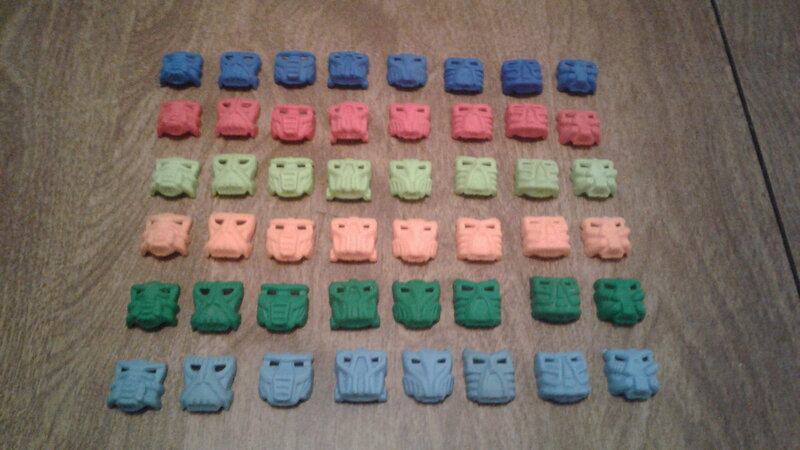 I have all the collectable G2 masks except for the trans-blue Gali mask.